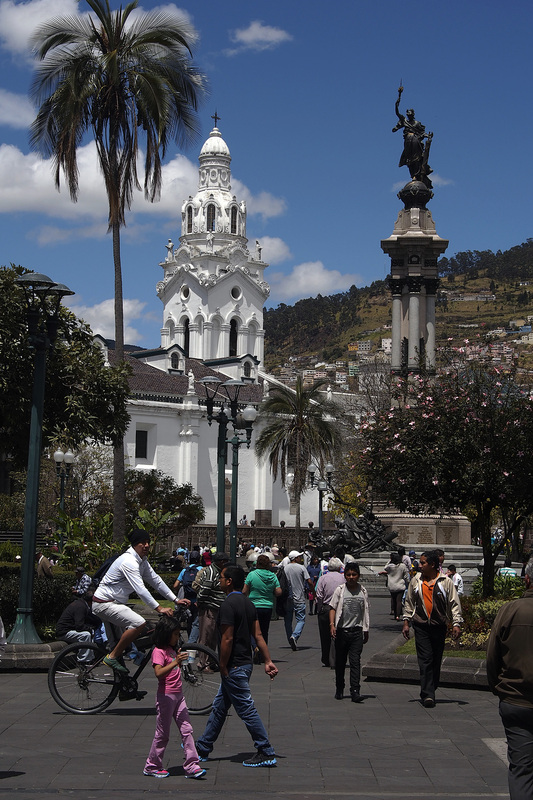 After 16 gloriously freeing months cycling nearly 20,000 KM across half the planet we landed in Quito, Ecuador, the first city to be named a UNESCO World Heritage Site for its best preserved, least altered historic centre in Latin America, despite a 1917 earthquake. 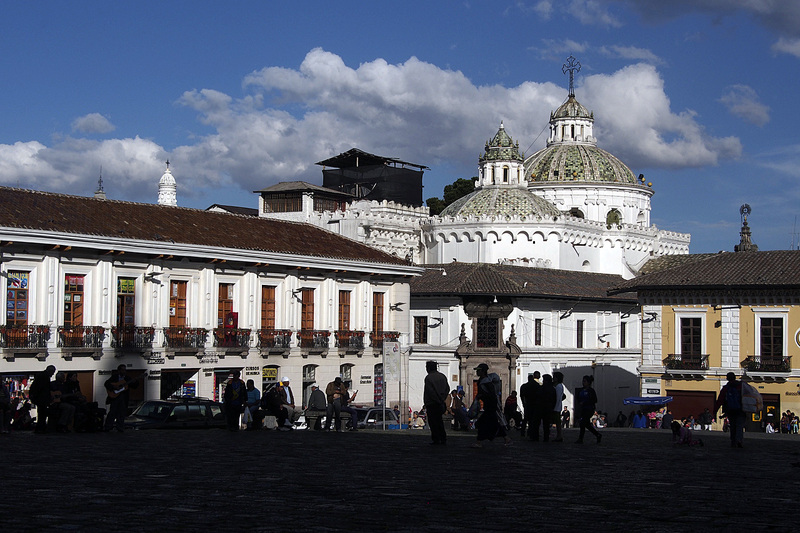 According to UNESCO, the monasteries of San Francisco and Santo Domingo, and the Church and Jesuit College of La Compañía, with their rich interiors, are pure examples of the ‘Baroque school of Quito’, which is a fusion of Spanish, Italian, Moorish, Flemish and indigenous art. 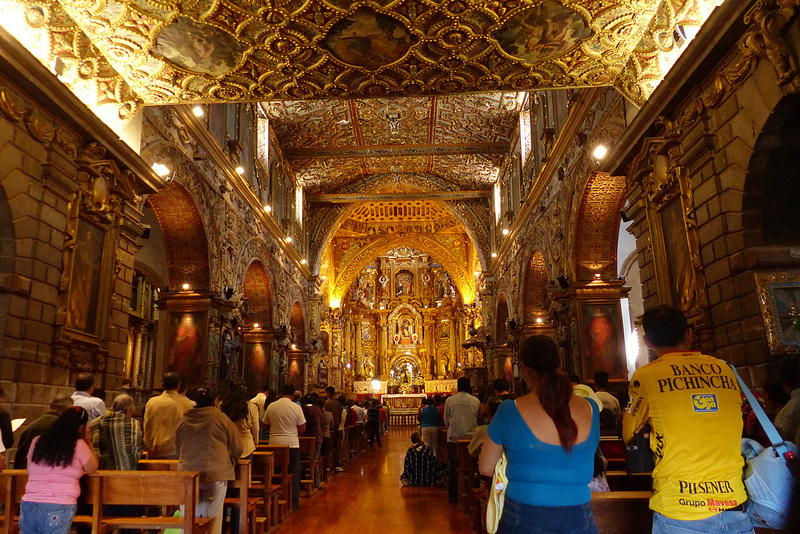 The gilded Jesuit church La Compaña de Jésus, dubbed the most beautiful Church in the Americas. Building began in 1605 and completed in 1765. 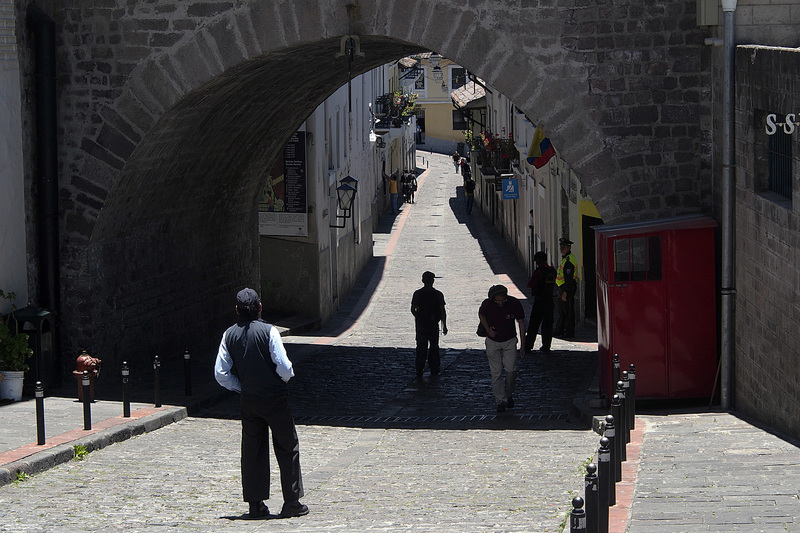 Beyond the preserved architecture of the old centre, modern Quito, containing nearly 2.5 million people, sprawls north and south through a valley at 2,850 metres above sea level, making it the second highest capital in the world. La Paz, Bolivia is nearly 800 metres higher. From north to south, the city runs about 35 kilometres. It’s big. 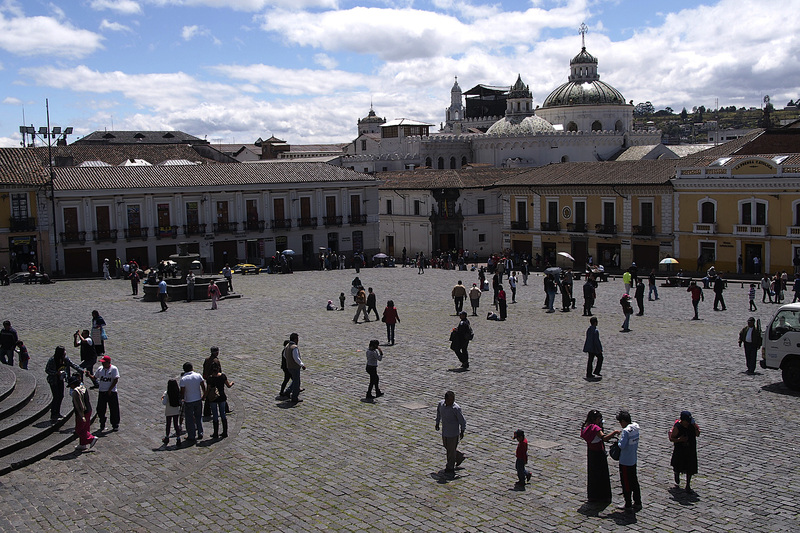 Plaza San Francisco in late afternoon. We rented beautiful Casa Liceo through Air B and B for six days. It’s located in La Loma Grande, on the edge of the historic centre and a great location for exploring the city, which is what we did. 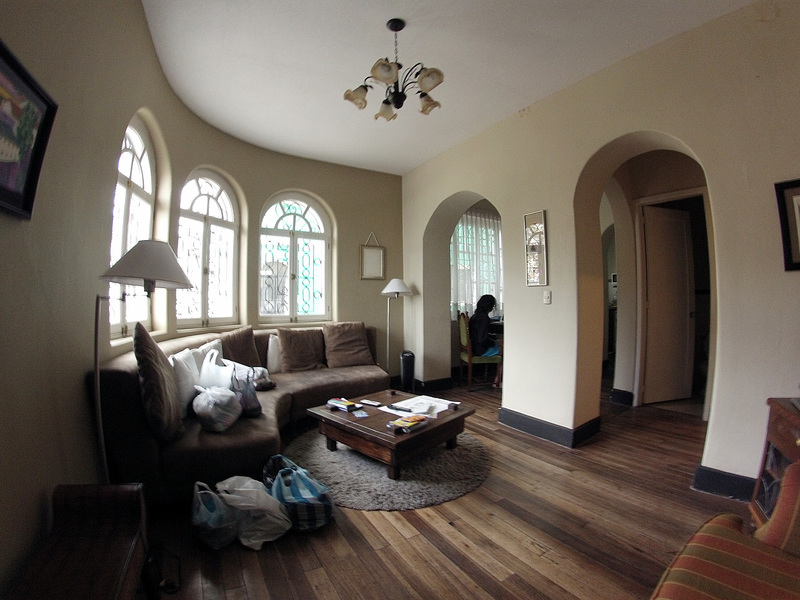 Our apartment in Quito: Casa Liceo. It’s easy enough to walk everywhere, especially on Sunday when the historic centre is closed to traffic and the bicycles take over. We wandered the streets, looking at some of the many churches and convents. We checked out some of the museums as well and tried a different restaurant for lunch and dinner every day. Old Town is closed to traffic on Sundays and bicycles take over the city. La Ronda is a narrow street that used to be known as Jerusalem Gully. 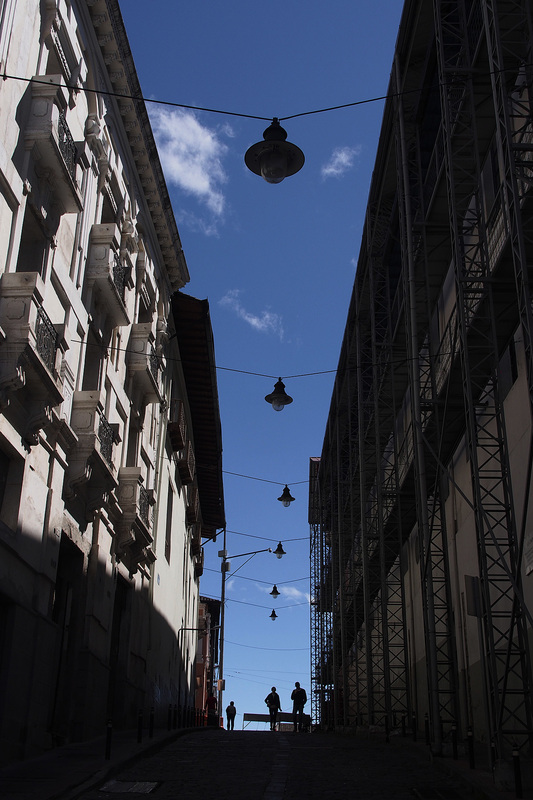 It is filled with eateries, cafés, gift shops and artists’ studios. On Saturday night, it was hopping with live music in just about every venue but on Monday night it was completely dead with hardly a soul around and many of the shops and restaurants closed. Slowly, things came back to life throughout the week. La Ronda, also known as Jerusalem Gully. 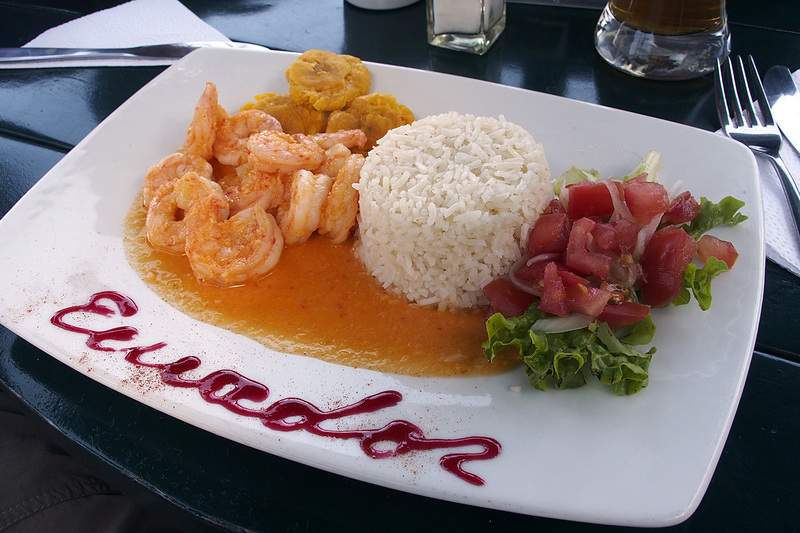 Yummy shrimp and coconut sauce lunch. 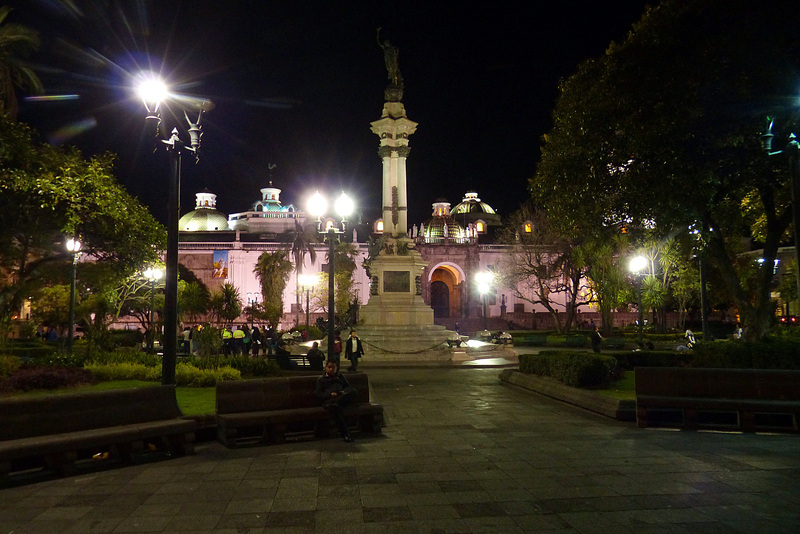 Plaza Grande and Plaza San Francisco are two of the show pieces of the historic centre. 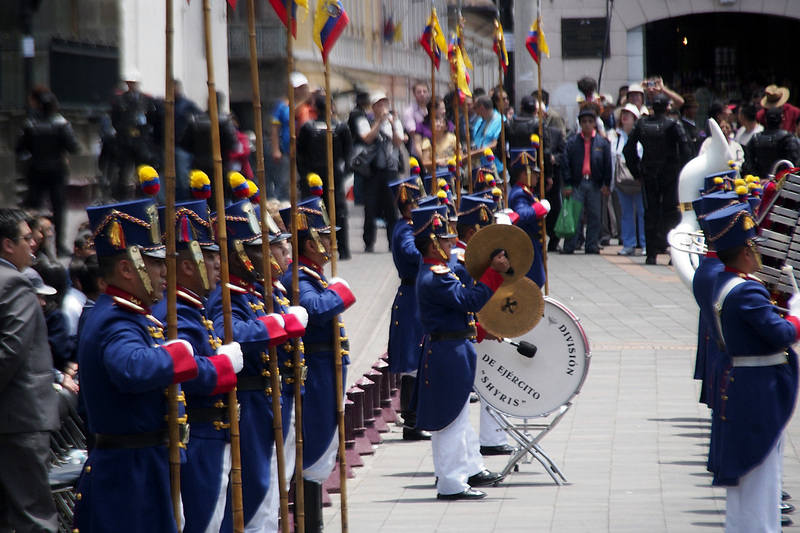 On Monday morning we joined hundreds of other onlookers for the weekly changing of the guard at the Presidential Palace in Plaza Grande. Quite the pomp and circumstance, complete with brass bands, mounted soldiers and the President himself regally waving from the balcony to his somewhat disgruntled subjects. There were protests in every plaza the following day. 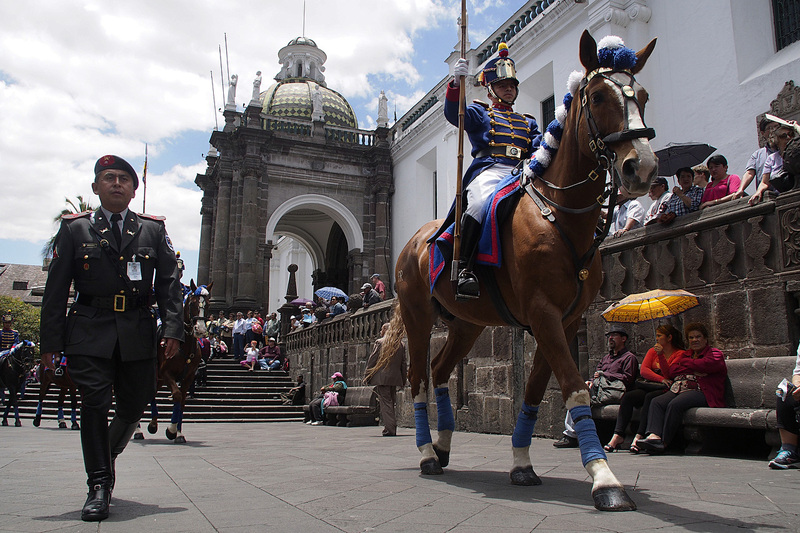 Changing of the guard at the Presidential Palace on Plaza Grande. 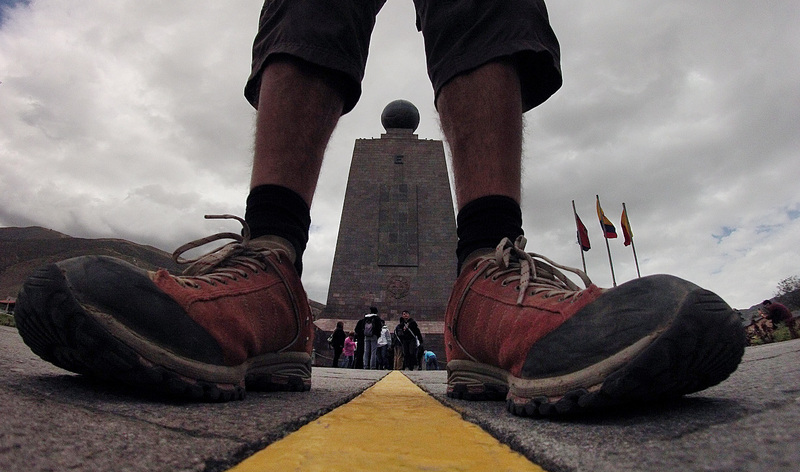 One day, we braved Quito’s public transit to go to Mitad Del Mundo, the middle of the world, or the Equator. 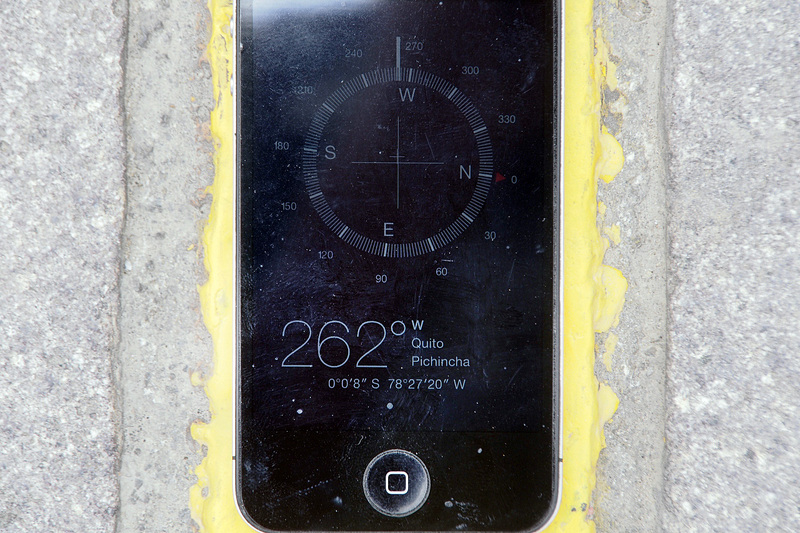 A large monolith was erected in a kind of theme park and a bright yellow line runs through it all, denoting where the Equator is supposed to be. In fact, it’s about 250 metres north of where the line is. The GPS shows the equator is about 250 metres further north and not at the Mitad del Mundo park. Quito’s buses are amazingly efficient and well used. Extended trolley buses run on three lines through the city and have dedicated lanes separated from all other traffic, except cyclists who allowed to use those lanes. The stations are closed off, much like a subway station, and passengers have to enter through gates to pay the fare of 25 cents. Yes, 25 cents is all it costs to go anywhere on the bus. By the way, Ecuador uses the US dollar. It took about half an hour to get to the end of the line where we transferred to a local bus, taking us to Mitad Del Mundo. The buses were packed to the rafters, probably beyond capacity, but were very efficient. The same trip in a car would take twice as long. 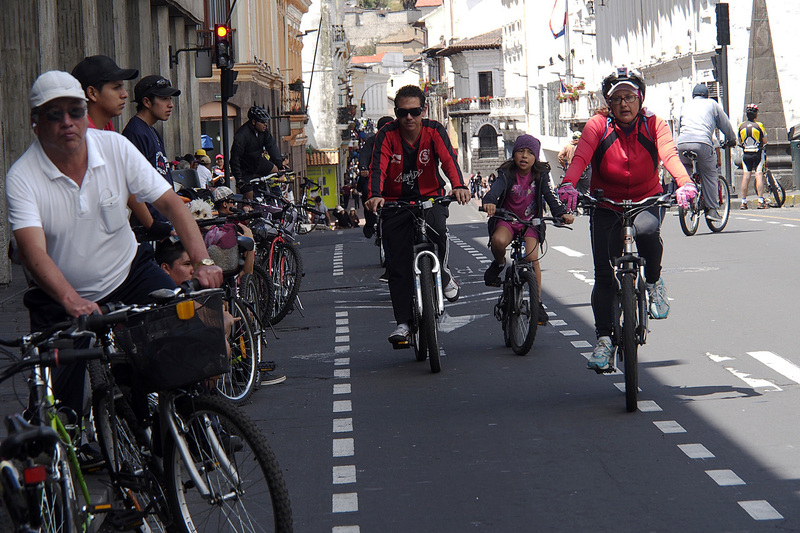 Traffic is always jammed in Quito but because of the dedicated bus lanes, transit works well. A subway line, Metro de Quito, is under construction and is scheduled for completion in 2017. 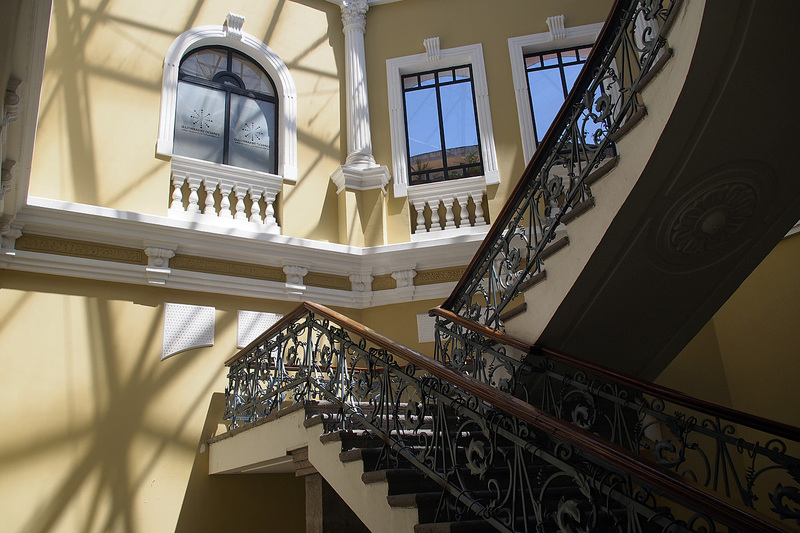 It will run right across the city, all the way to the Mariscal Sucre Airport. 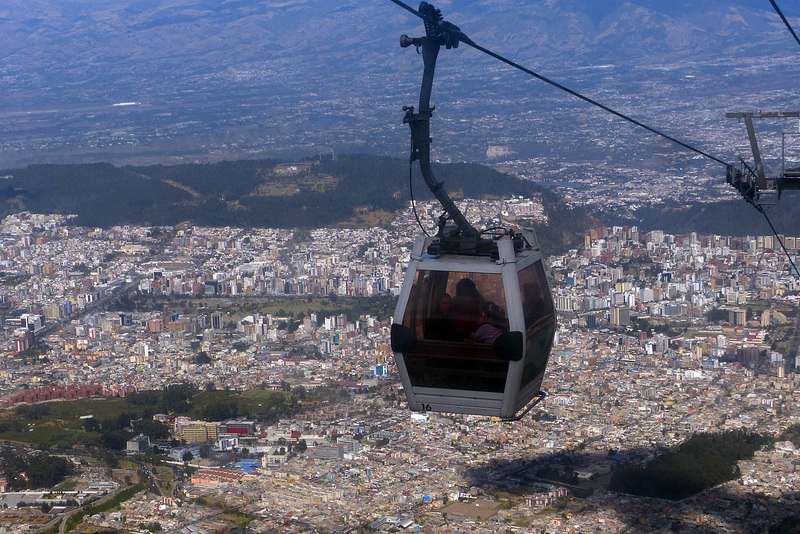 The TeleferiQo, gondola, goes up the flanks of Pichincha Volcano to about 4,000 metres and offers a sweeping view of the city. It was a nice ride but not that easy to get to other than by a $3 taxi ride. 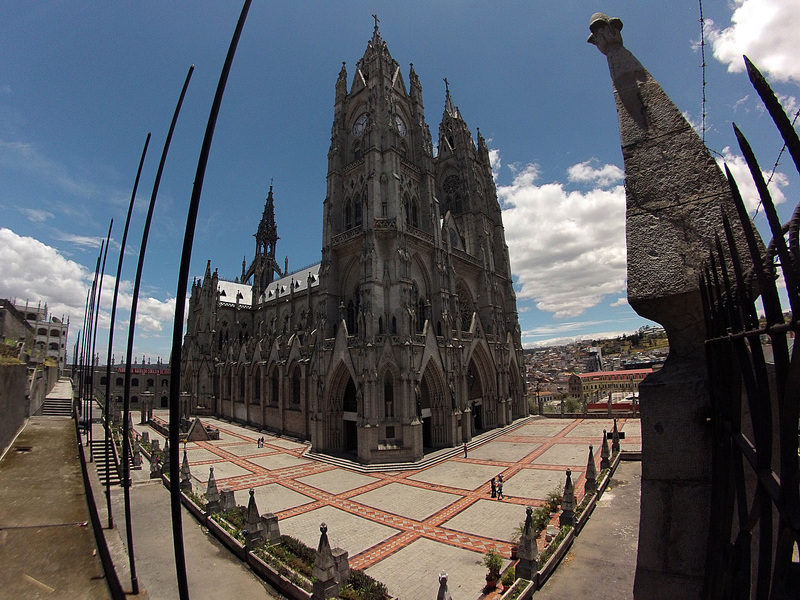 We also scaled the clock towers of Basilica Del Voto Nacional, the largest neo-Gothic basilica in the Americas. The neatest part of the church are the grotesques in the form of animals native to Ecuador. Jutting out from the building like gargoyles are giant tortoises, iguanas, pelicans and armadillos. 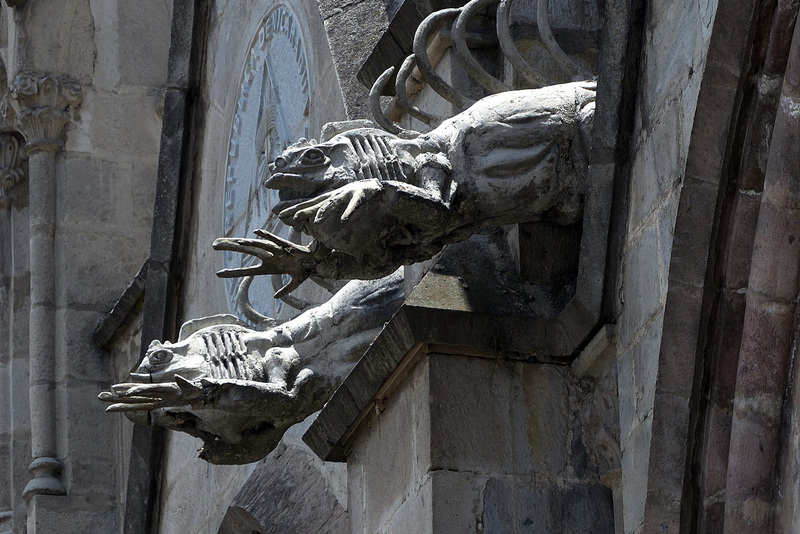 Iguana gargoyles on Basilica del Voto Nacional. Other gargoyles included giant tortoises, albatros and pelicans. 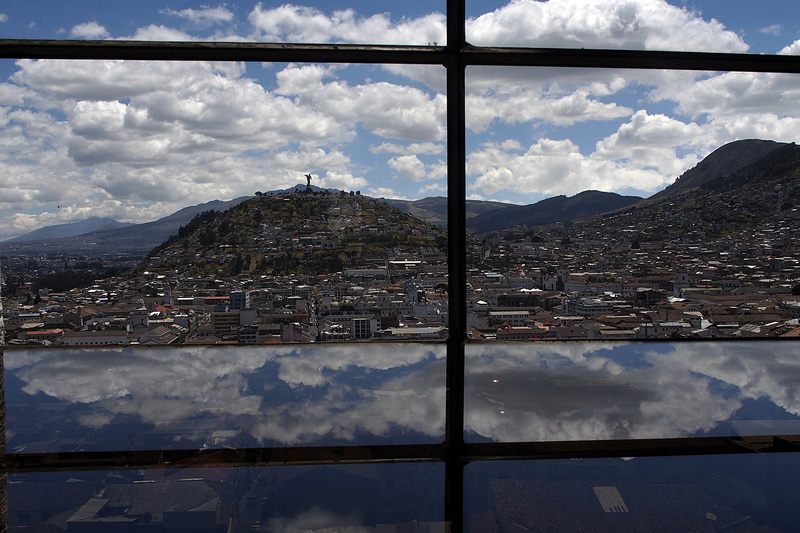 The view from the coffee shop, located about half-way way up in one of the 115-metre-tall spires, is one of the best in Quito. 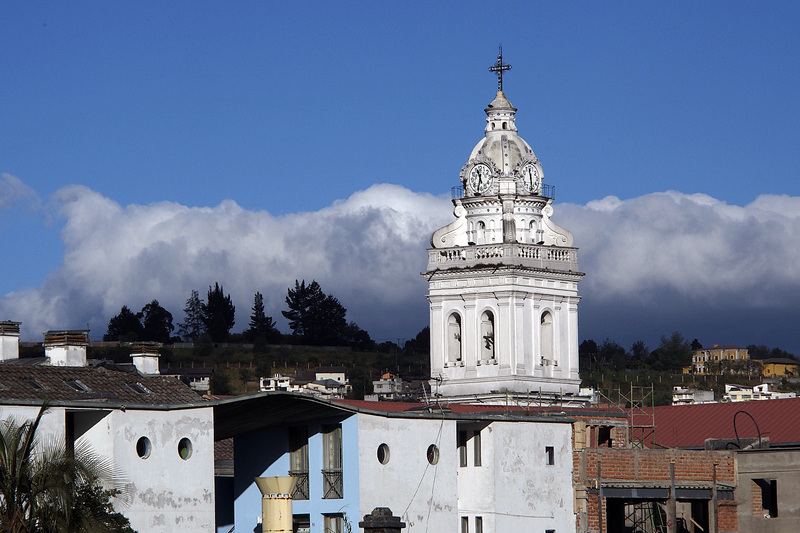 View from the coffee shop of Basilica del Voto Nacional. And on the subject of coffee, Ecuador has some of the finest. 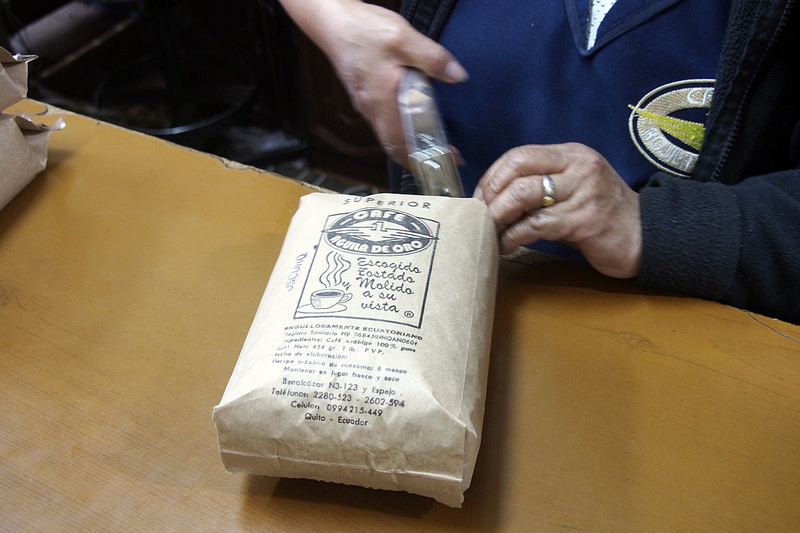 We found a small coffee roaster in Centro Historico. 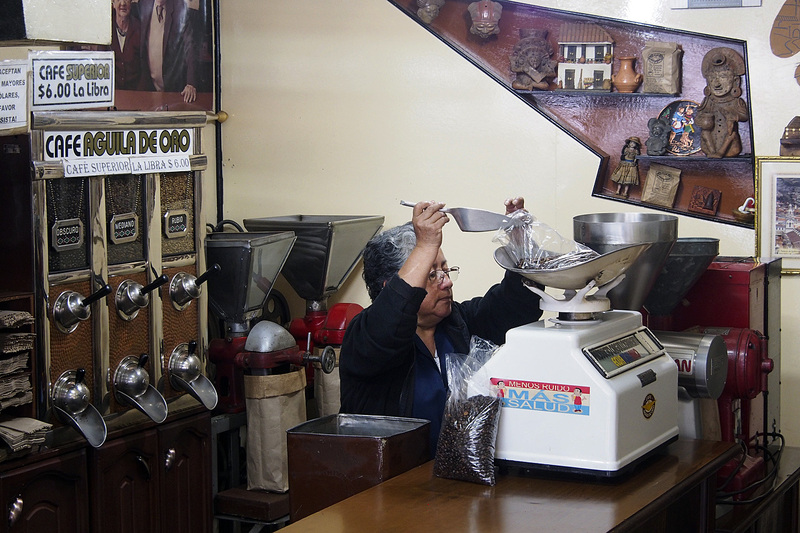 Lured into Aguila De Oro by the aroma of roasting beans, we walked away with several pounds of the stuff. Coffee roaster weighing out the precious beans. Packed and ready for shipment to Canada. 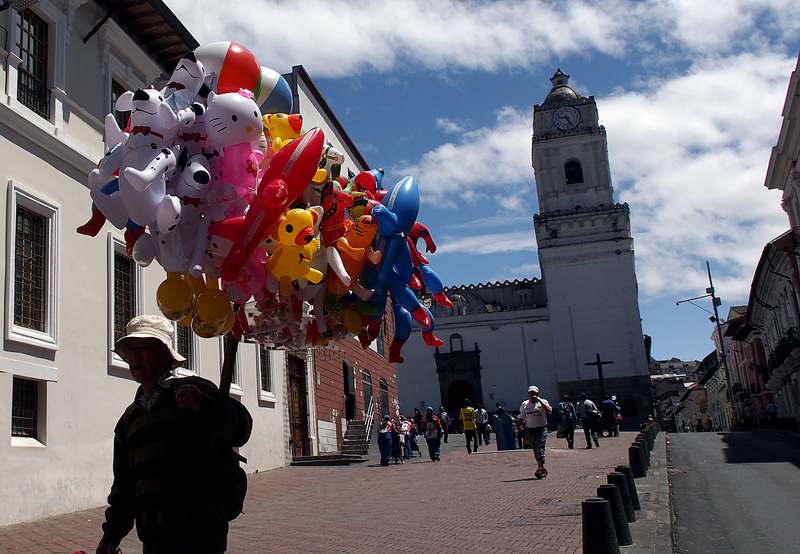 We loved Quito and will probably come back here. It’s a safe and easy city to get around. We met some lovely people, including Santiago and Karina. Santiago is a jewellery maker and sells his art in the La Ronda market on weekends. He made us each a pendant as a gift. 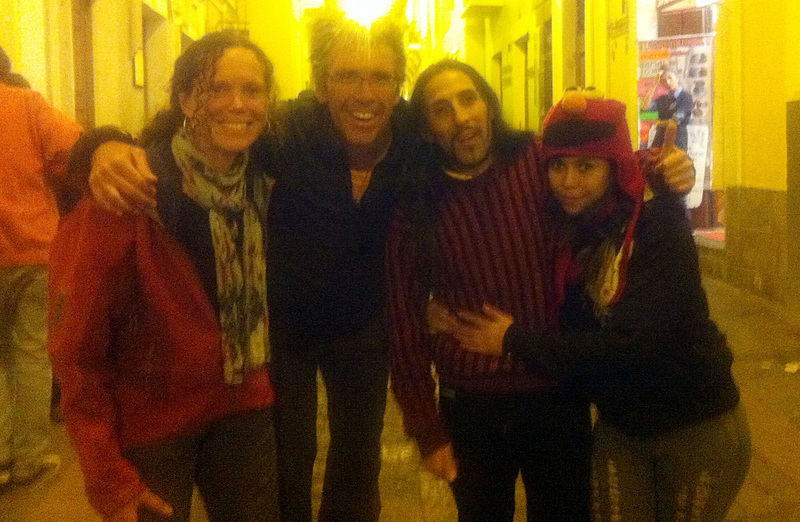 With Santiago and Karina in La Ronda. Food is cheap and good and there is lots to see and do. It was a nice few days of relaxing and processing the fact that our journey has come to an end and it’s time to go home. It’s been a great ride and one to be continued. We’ve uploaded some of our favourite photographs. There is a link at the top menu. There are also about 4,500 photographs on my Flickr Page. Each country has its own album. You can brows the albums or play them as slide shows. The videos are posted on our Vimeo page. 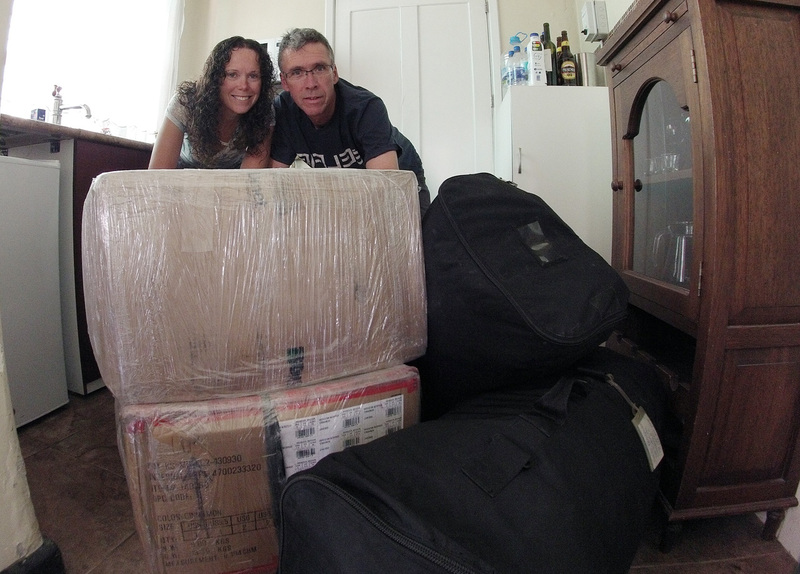 After 16 months on the road, with the bicycles packed in two boxes and the rest of our stuff in the two bags and we’re ready to come home. 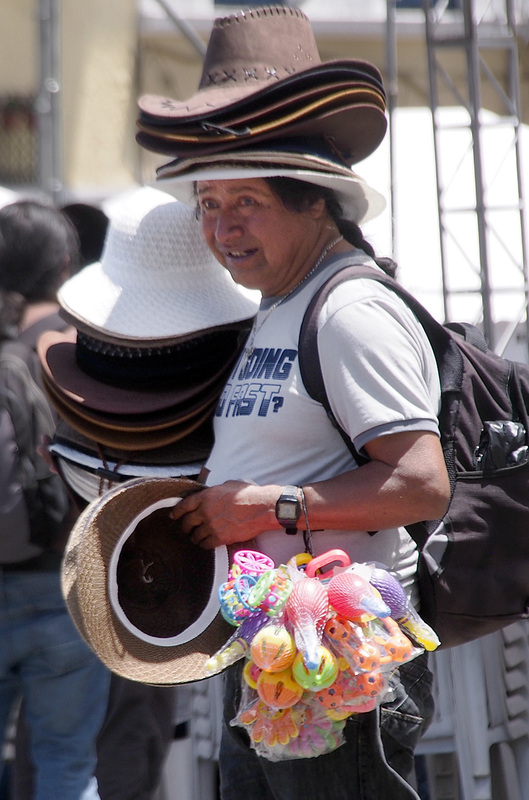 Selling hats, a much needed accessory to shield the intense equatorial sun. 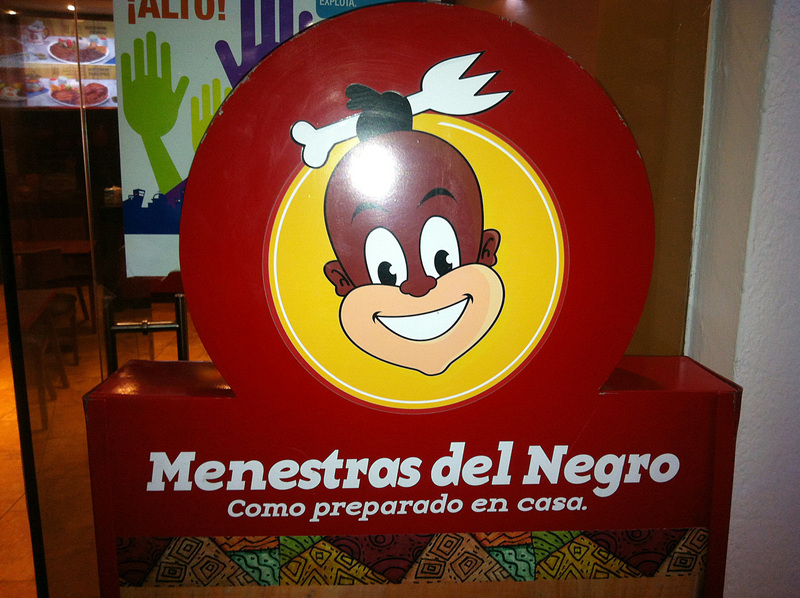 A popular fast food restaurant in Quito’s Plaza Grande. 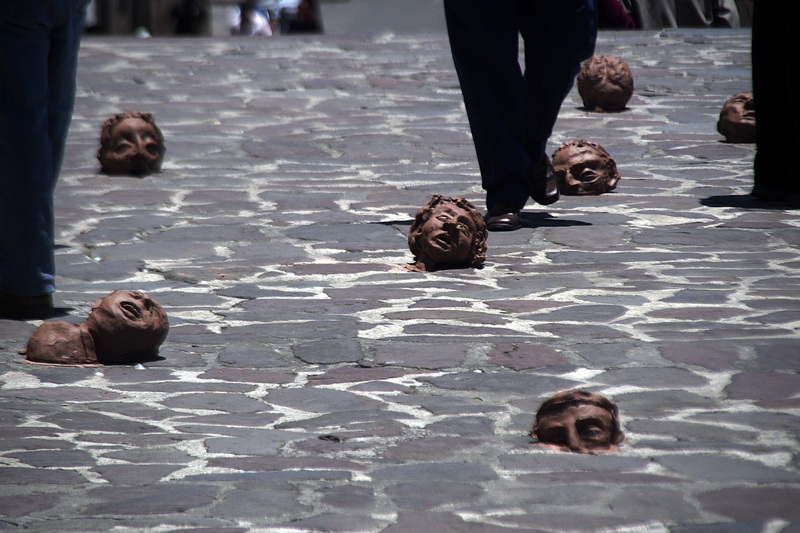 Pedestrians walk through a guerrilla art installation in Plaza San Fransisco. Looking up Calle Guayaquil from La Ronda. Thank you SO VERY MUCH for including us in your amazing 16 months!! We don’t all release the courage and stamina which you and Jan have done to accomplish such a journey….however through your wonderful photography, video and stories, we were able to imagine, and create stories in our own lives more easily!! Thank you! Thank you!! Congratulations on a great trip and thanks for sharing. Quito . . . . . looking great. We were there in 1998 for 3 months. Welcome home to Vancouver and warm greetings from the Netherlands. We followed you all the way, saved all your pictures, which I now have to check again in order to make some nice wall decorations. Greetings and blessings. I have been following your journey for many months. My long time friend Maryanne alerted me to your journey and blog. I did my first bike journey with her along the Rhine River many years ago. I am so inspired and in awe of your adventure. Wonderful! Your photos are absolutely tremendous. Thanks for sharing. Welcome home to Canada. 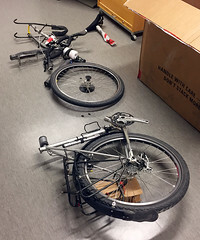 Thanks Paul and Jan for sharing your experience with fabulous photos and commentary. I’m a friend of your mothers and she must be so proud of your accomplishment. Enjoyed and saw places thorough your pictures which I will never be able to see in real time. An amazing tour. I’ve really enjoyed your posts for the last 16 months and feel like I’ve been on the journey with you. The photos have been truly amazing. Thanks for sharing your adventures with us and I look forward to the next installment down the track.